These Patterns should work through-out Summer! Carolina Rigged Lizards fished with 3/4 oz sinkers and a leader of 12 - 18 inches. Main line is best at 17 - 20 pound test with leader being 14 - 17 test. These rigs are great this time of year for fishing areas like (B) and (C). Make long cast and feel the bottom for rock stumps and grass. 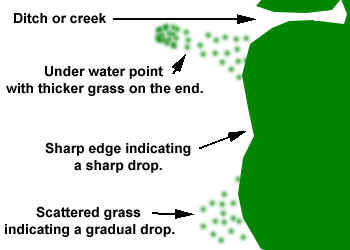 Hits will come when you find a bottom change like (grass to no grass) - (Soft bottom to hard bottom) and so on. Best lure going for locating bass. Also Great for Carolina Rigging in same color codes: Ah, The ole shallow running crank baits for summer bass. I like to fish them over the grass you can feel but not see. Fish areas like (D) and (C). Most areas have grass out to about 8 foot and this is where you need to run you shallow crank bait trough. Ideally you want to tap the grass from time to time. A good floating crank bait with back up and free itself of grass if you stop winding as soon as you feel the grass. Original Bill Norman™ Crankbaits - Baby N - 2"
Rapala® Down Deep Rattlin' Fat Rap® - 2-3/4" Top water on Guntersville can not only be good but heart stopping as well. The most popular is of coarse, the buzz baits. I like to use a small and larger buzz bait in either chartreuse or white. To me buzz baits a better suited for fishing larger areas like (C) and (A). Each day seams to bring a new trick for the bass to strike. One day a 1/2 oz chartreuse worked but the very next day they will only hit a 1\4 white, so swap up. Pop R's and spooks Fished in smaller areas like (D) and the isolated cover of (C). How To Deal With All Of This Grass? All of the grass can be intimidating, especially to new anglers. As most may know grass can only grow just so deep. This means that it must stop growing at certain depths. This creates edges. Remember most edges are unseen. There is the first key to dealing with all this grass. We must first find an edge to fish and then try to break down from there. It could be a creek channel or a point or the main lake. I like to look at farming fields as an example of this. The fields are the open water while the groups of trees are the grass. The farmer left the trees there for the same reason grass would grow there. Might be because it was to close to a creak, on a hill, was next to a road, etc. So next time you are looking into a farming field think of it this way. If you took all of the water out of the lake and left the grass it would look the same. Now we are getting somewhere. Starting with the points of tress, (grass) we see that the trees stop at the point of the hill but also the trees leave an edge on both sides. The trees on the points are the obvious edges but all along the hill we see rocks, stumps and other things making those edges unique. Plus the short tress and bushes are the grass that goes unseen. Now we look at the trees (grass) along the farmer's creek. We first see the creek has bends making it so the trees must fallow the curves. Again we see rock and wood cover. We also see places where there are less tress or more tress, this too can be a great find. Bass will be in this grass because of the creek. But in a certain place because of the bends, rocks or a change in the thickness of the grass. You can take any grass bed and break it down into sections of greater likelihood. When fishing a grass edge think out loud, "why would a bass be here?" If it takes you long to find a reason to pick this edge out of the thousands, you're in the wrong place. Most importantly is the reason, once located, will be the same reason on your next stop. More to come as conditions change. This page will be very helpful I promise!